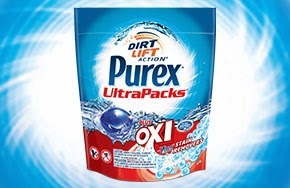 I love Purex detergent! The price can't be beat and your clothes come out clean and fresh. There is nothing that I like more than saving money on the things I normally buy. Now through December 27th, Cartwheel is offering a 25% off the purchase of Purex. Talk about perfect timing since this is the time of year when laundry doubles, at least it does in my house. After a few months of washing the multiple layers my kids wear in the winter, I miss sundresses and shorts. Head over to Cartwheel and download your coupon today!